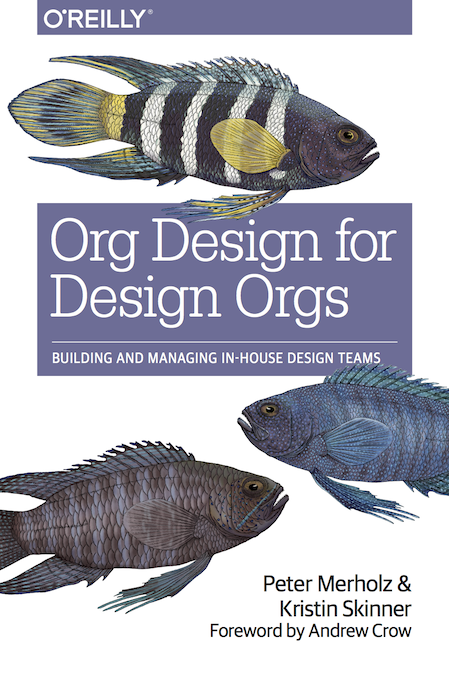 Typically, design orgs are significantly smaller than the engineering orgs they support. Designer:developer ratios are usually between 1:4 and 1:10. In the diagram here, we’re looking at 1:6. In the book, we discuss the benefit of this ratio—design is a highly leveraged function, where a relatively small number of designers can have an outsized impact. There’s a dark side to this though, in terms of perceived authority and influence. In this example, the figure in black is the design Team Lead, overseeing the work of 5 others. On the engineering side, that gray-ish figure oversees 30 engineers working with those designers. Companies typically assign levels and seniority based on the number of people in someone’s organization. And this is where design orgs get fucked. With 5 people in their org, the Team Lead would be considered a Manager, but the Engineering Lead, overseeing the work of 30, would be considered a Director, maybe even a Sr. Director. And so, while the Team Lead and Director of Engineering are peers when it comes to matters of scope, most companies would invest greater authority with the role overseeing more people. As long as this persists, design will remain the kid sibling of other larger functions, and have trouble being seen as a true peer.